What happens to your website traffic and leads if you stop blogging for six months? Comparing data points shows the impact on a business and what type of return can be expected when turning the switch on and off versus staying with it for the long term. Here’s the data for a blogging strategy that began, had success, then stopped after six months, then waited six months, and started again. The chart below shows total website traffic per week starting January 1, 2010. Traffic increased rapidly from 100 to close to 600 visitors per week, a gain of 600%. Great content from a great business, a local physician, posted on a regular schedule, and boosted by social media promotion (shown in teal) resulted in 15-20 website leads per month. This was an increase from zero at the start of the campaign. On June 1st, due to a buyout/merger, blogging was discontinued. For the next six months traffic decreased and then leveled out at less than 200 visitors per week. 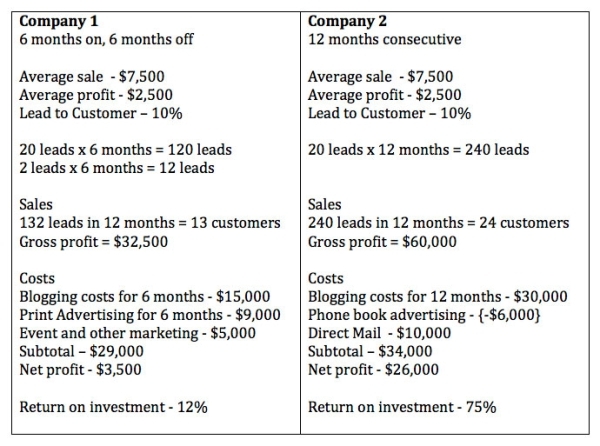 Leads decreased to 1-2 per week. Six months later, management approved a continuation of blogging services. See data beginning 11/29/10. Corresponding with the six month on and off pattern, weekly website visits from organic search showed gains in relation to blog events labeled “E”. During the six months of non-blogging, as leads continued to decrease, money was spent on print advertising, special promotions and events, and marketing literature. For comparison, here’s data for a second company, with a blogging strategy that began, and continued for 12 consecutive months. The chart below shows weekly website traffic starting May 1, 2010. Traffic steadily increased over the next 12 months from 200 to close to 400 visitors per week, a gain of close to 200%. Great content from an established local HVAC company, posted on a regular schedule, and boosted by social media promotion resulted in 15 – 20 website leads per month. This was increase from close to zero. Corresponding with the 12 month increase in web traffic for the second company, website visits from organic search showed gains for blog events labeled “E”. During the 12 month period, these improvements in “Getting Found” by the search engines resulted in decreasing the budget for directional advertising expenditures such as phone book advertising and print ads. The company is now on the first page of Google for well over 200 geo-targeted and long-tail search phrases. The two examples shown reflect data collected for only two companies. 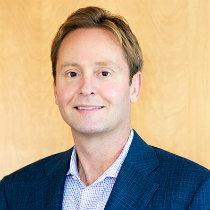 The trends however, are similar or the same for over a dozen companies tracked using the same methodologies. The impact on business is calculated by the initial sale only, but the lifetime value of a customer is much greater. The two companies were selected as an example to show return on investment (ROI) data since the average sale and average profit were similar. Company 2 has a much greater ROI due to consistency and the ability to reduce other advertising costs. Website leads represent only part of the leads each company receives. Overall leads when including phone calls, is a much greater. Using the higher number in the lead range is still considerably understating the actual ROI impact on these businesses. Blogging is only one part of content marketing and blogging costs in this example are calculated at $2,500/month to include art direction, copywriting, search engine optimization, and social media promotion. Many blog writing services, such as SocialTract provide an outsourced option for blogging at a much lower rate. What if Company 1 above had continued for 12 months, versus 6 months on and 6 months off, and didn’t spend money of print advertising? This resulted in a 71% versus 12% return on investment. 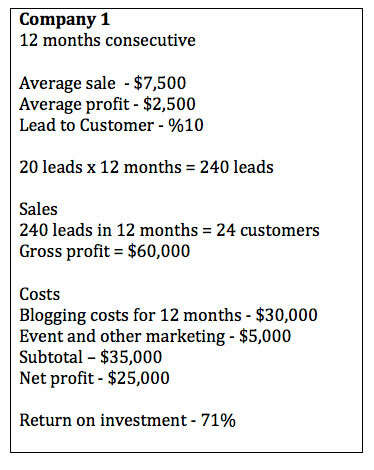 In this example, stopping the blogging services for 6 months costs the company $21,500 in profit. It lowered ROI by 59%. Inbound marketing agencies and software vendors are often touting the positive impact of inbound marketing (blogging, social media and integrated campaigns) on corporate ROI, but seldom do they talk about the actual numbers. In comparing these two companies, we see a direct correlation between inbound marketing effort, especially blogging, and return on marketing investment. The bottom line is that a company may save some direct costs by scaling back or discontinuing blogging, but the opportunity cost of doing so can be significant, especially when your competitors are continuing their efforts. I hope you find this data useful and will subscribe to this blog for future updates. The above originally appeared as a guest post on the SocialTract Blog on June 10, 2011.